A Windsor expert on the value of gold believes it’s value will continue to climb in 2011. Disclaimer: Trading and investing in precious metals is highly volatile and risky. Past performance is not indicative of future results. Please consult with a registered financial advisor or tax professional before investing in precious metals. If the past year has been a good one for gold, then it’s been a great one for silver. 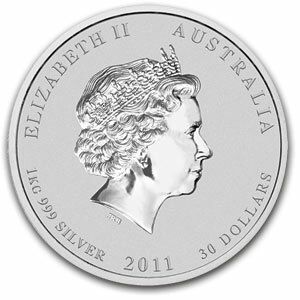 Since August alone, silver prices have jumped more than 60%, crossing the $30 an ounce threshold. 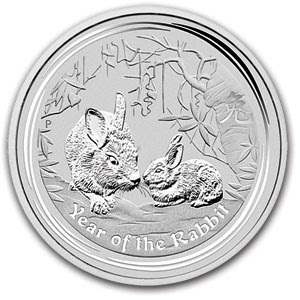 Year to date, the price of silver has averaged $19.86/oz, a 35% increase on the 2009 average. Over the past few years we have seen multi-decade highs in practically all commodities especially metals. We have heard all the arguments about Gold; is it money or an ancient relic, Platinum; is it a precious metal or an industrial metal and of course Copper; the ultimate industrial metal. All three have significantly broken their 1980 high. So why does Silver "Get No Respect?" China’s Golden Surprise: A Glittering Opportunity? This is the kind of thing that the Chinese usually keep a secret. No one knows why Beijing broke with tradition. But perhaps the news was too big to contain behind the usual wall of silence. If you hadn’t already heard, China’s gold imports are up – way, way up. In the first ten months of the year, China’s gold imports jumped fivefold. With two months to go in the year, China had quintupled its intake of gold compared to the full year of 2009. This is big! Remember, China is already the world’s largest producer. Yet its gold imports rose to 209 tonnes in the first ten months – up dramatically from just 45 tonnes the year before. Of course his solution for protection is to own physical Gold and Silver. Priced in Gold, the So Called S&P 500 Rally is a Dud! For those who continue to ignore the fact that Gold is "money," not an investment, here is a chart of the S&P 500 index priced in Gold. As you can see the "rally" is not very impressive when priced in Gold. The big illusion is that the "price" of Gold is going up. 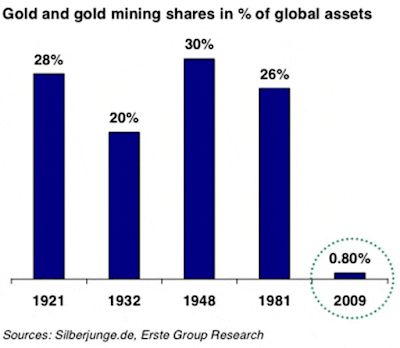 As we have been saying for some time now, Gold doesn't change. An ounce of Gold today is the same ounce of Gold a thousand years ago, the difference is the quantity of dollars it takes to buy that ounce of Gold. So it's not about Gold it's about the dollar losing value against Gold and other commodities. There are many who misunderstand Gold, it is not supposed to have a cash flow, P/E ratio, dividends or pay interest because it is money! 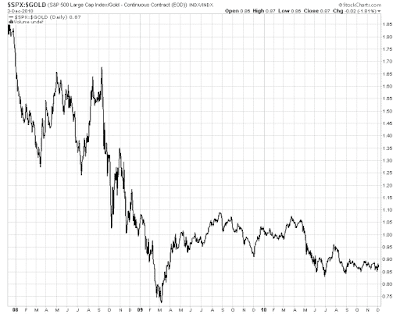 Does the Canadian dollar pay dividends or interest? NO! Gold is a form of cash and people go to Gold when "confidence" in government and markets is lost. It is the last resort currency to protect ones wealth. Throughout history governments around the world have used Gold as a backing to their currency, and there's a reason for it. Which is a whole different topic all together. Basically Gold is a barometer of fear in the market and those who choose to ignore the fact that the financial system is broken will suffer the consequences because I assure you that the powers that be or the "internationalists" know what's happening and they own Gold, and the physical bullion not paper substitutes. Just listen to Peter Munk's comments in the Charlie Rose interview below, he says that his billionaire friends have concerns about the markets and they're going to Gold. Even in Davos 2009 Mr. Munk was telling us the same thing. We agree that a high Gold price is not a good sign for the economy and the markets but we cannot ignore the facts, Gold has been the best performing asset class in the past ten years and all the fundamental signs are pointing to a much higher price. Just ask yourself what will be the result of all the bailouts, stimulus and Quantitative Easing (QE) that the FED is creating? It surely hasn't returned any jobs to America and Chairman Ben Bernanke even admits it in his recent 60 Minutes interview. When will we see the first $100 move in a single day in gold? “Before this year is out. That is one of the things which I’ve predicated my $1,650 by January of 2011 call on, and we are about to find out. Hong Kong goldsmiths have been sold hundreds of ounces of fake gold this year in one of the most sophisticated scams to hit the Chinese territory’s gold market in decades.